All of us who live in Turkey are very familiar with the myriad dishes that come under the heading of Börek. They are all made with yufka, the Turkish equivalent of filo/phyllo pastry and filled with either white cheese/feta ,spinach, or mince. No Turkish gathering is complete without a börek in some shape or form! To tell you the truth, I have not got into them in any big way simply because they are not exactly slimming. I know that TT, bless his heart, probably yearns for them because whenever we are out at Turkish friends’ homes and there is a börek, he enjoys it so much. 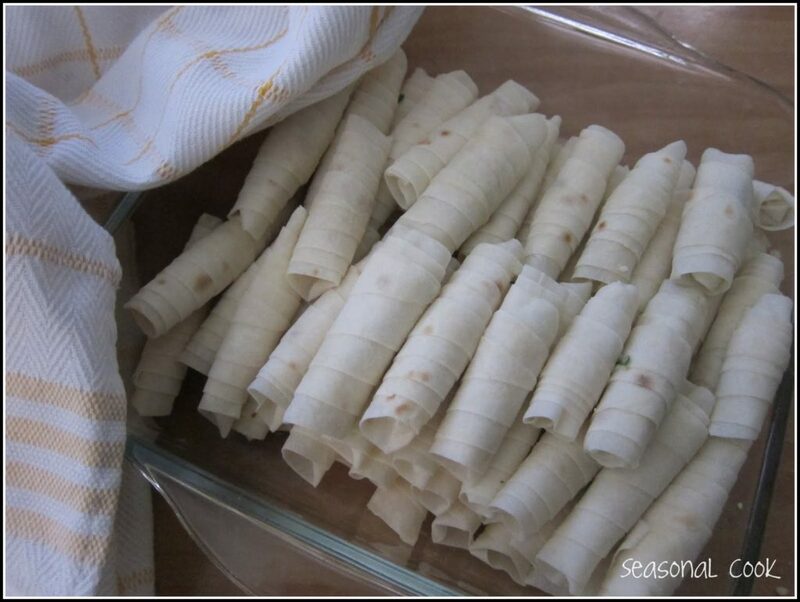 There is one form of börek that I have been making for years and it is this one. 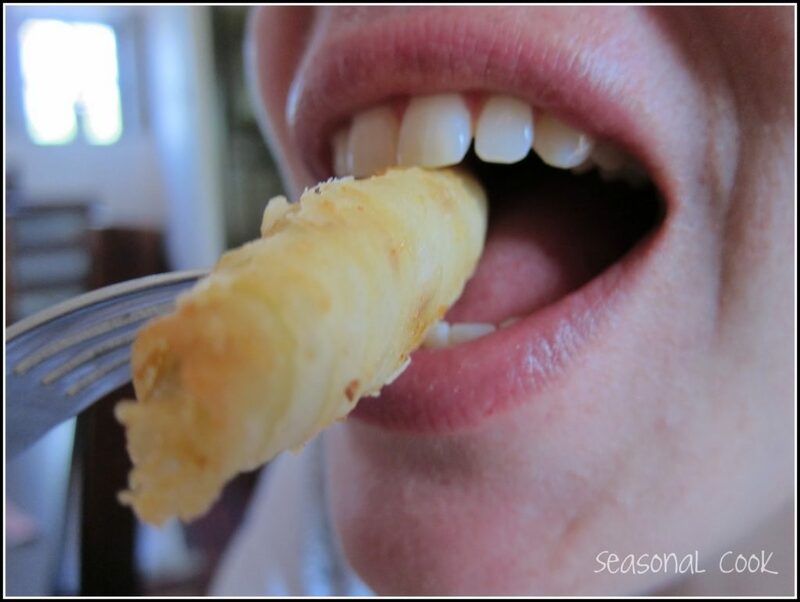 I highly recommend having a go because everybody loves them, they look great, and of course they taste delicious and go well with drinks western-style. When we lived in Tokyo, I used to make them with great aplomb and even gave a few lessons to my foreign friends as to how to make them. A few months back I was asked to demonstrate how to make them at my local IWI Neighbourhood Coffee Morning and we had a lot of fun with everybody trying their hand. Here in Turkey we are fortunate as buying yufka is easy. I recommend buying it from the little local speciality shops as opposed to the supermarkets where it comes in pre-packaged sellophane packs. Yufka must be fresh otherwise it doesn’t work. I mean it breaks and cracks. Even when fresh you must treat it with respect as it mustn’t dry out so keep it covered with a slightly damp tea-towel at all times while working with it. I usually buy 3 at a time and make a lot. The extra freeze beautifully and come in really handy when you need them. You buy the white cheese at the same place as the yufka usually. Ask for böreklik peynir as it is slightly different in texture to the regular kahvaltalık or breakfast variety. But if you can’t get it, then it isn’t that critical. I have tried filo and it is not the same thing at all. It is much finer for a start so you need to use at least 2 layers at a time if not 3. Also check the size. Our yufka comes in a large circular shape while filo seems to come in decorous little squares. Little triangles work better than this roll shape. 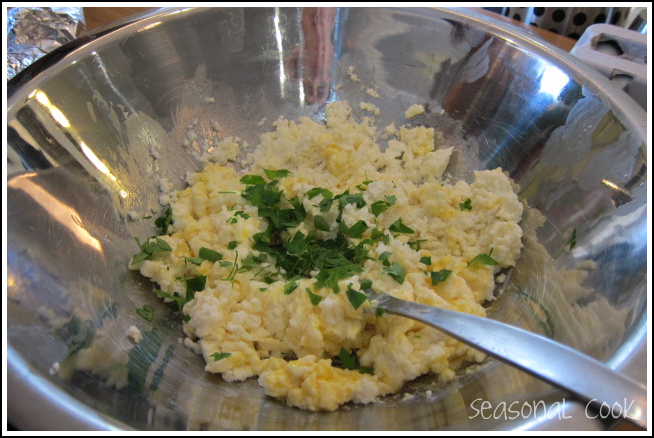 Mash together the cheese, egg, and parsley or dill to a smooth consistency. 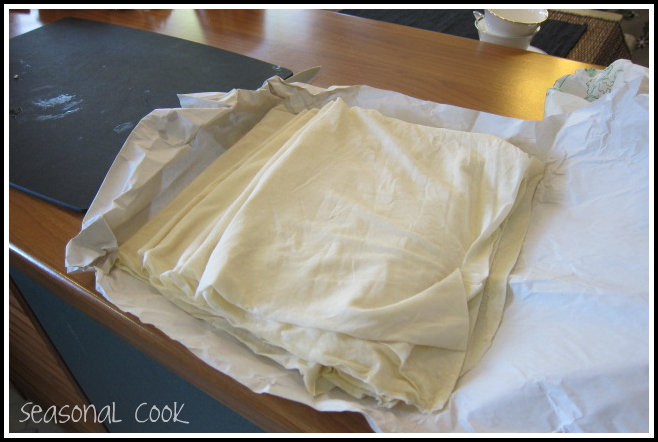 Fold one yufka in half then in half again, and then fold over one more time. Cut into 3 long triangular shapes. Pizza cutters work a treat. Don’t forget to keep the pastry covered while you are working. Take one triangular piece of pastry and place a little of the cheese mixture along the wider end. 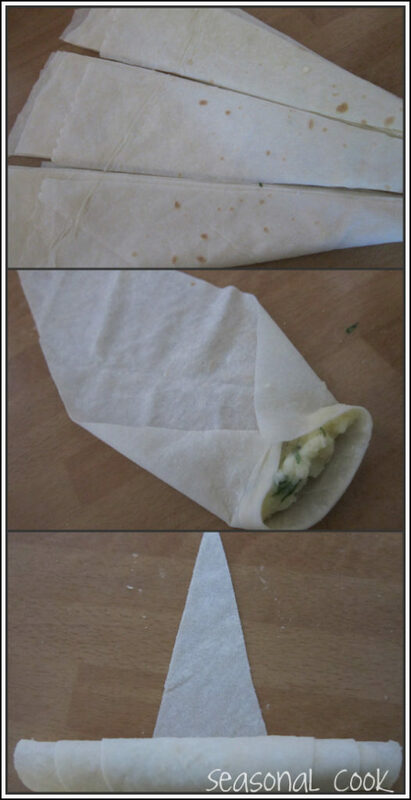 Fold over the pastry on either side to seal in the filling and then roll up tightly like a cigarette. Wet the end of the pastry with water so that it seals. 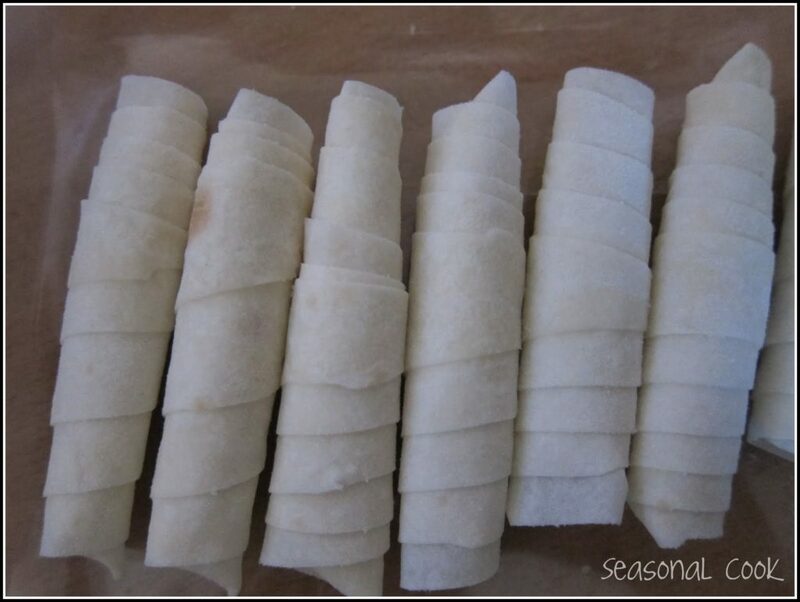 Continue with all your pieces of pastry till finished. Either freeze in plastic bags at this point or heat the sunflower oil in a shallow pan and fry the börek over a medium heat till golden brown and crispy. Serve hot as part of a meze spread. If you let them get cold, they may go soggy. If preferred, the börek may be brushed with oil and baked in a moderate oven for 20 mins. Of course I know burek:) I also remember me just reaching the view of my grandmothers table trying to pull jufkas to make thin pastry..and my tears when after all that work there suddenly a big hole appeared in the middle .And while I was crying my grandma would just put the dough together and I had to start again.Thank you grandma. These are a very special treat for the special people in your life Claudia. Scrumptious! Turkish food is amazing. Thank you all for your lovely comments which are so diverse and interesting. 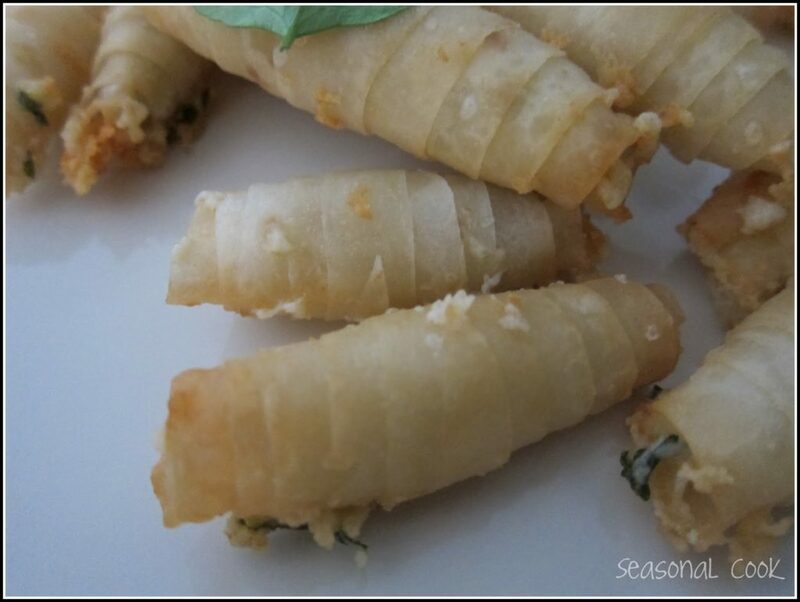 These börek are great and yes, Julia, fried is best!